Stokers opened in 1977 in Ivanhoe serving pancakes and coffee after dark. The old building was homely and full of character making it popular with students and couples looking for a late night dessert destination. The centerpiece of the room was the red open fireplace making it an ideal place to enjoy pancakes and a hot drink. Due to land development, the original location is sadly no longer there. 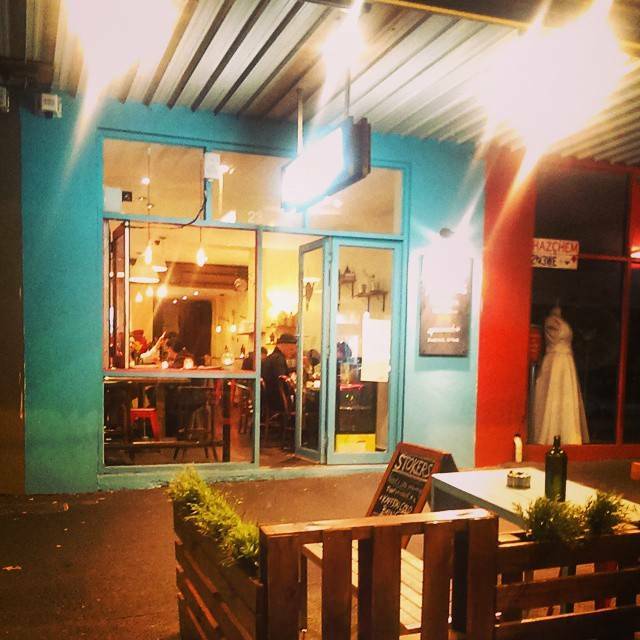 South Melbourne location opened in 2014 with an updated concept while keeping to what we're about, the Pancakes. 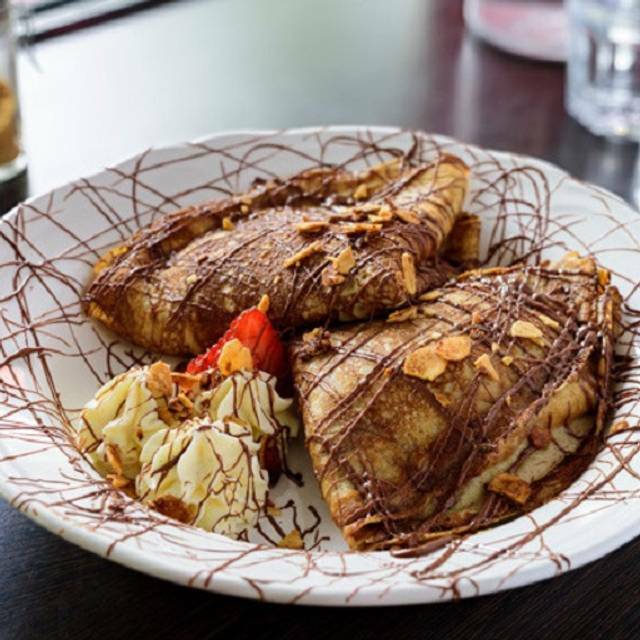 We're passionate about our pancakes and want to let you experience pancakes in ways you never have. 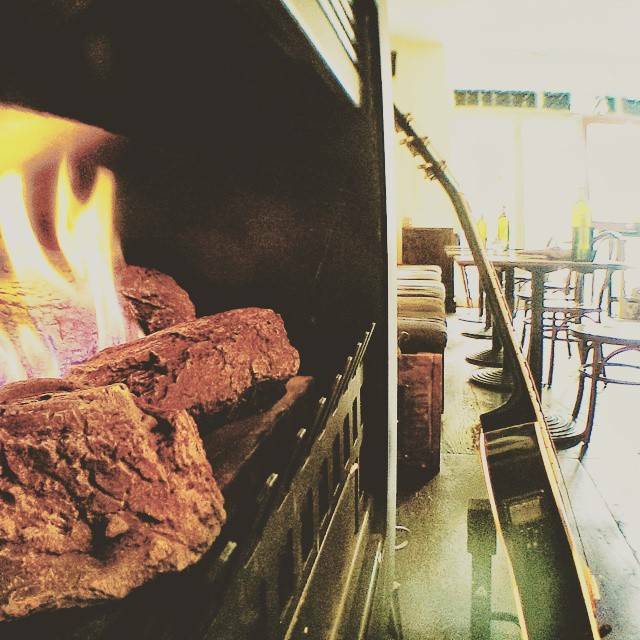 With an expanding variety on our menu and a cozy space (yes, we still have a fireplace), we hope to create lasting memories with a new generation of people. Eggs cooked to your liking, served with delicious pancakes or toast. Scrambled eggs and bacon wrapped in a pancake roll or in a sandwich. Spicy potatoes cooked with red and green chilli, mustard seeds, cumin, turmeric and onions wrapped in pancakes served with side salad. A serving of two pancake wrapped around a rasher of bacon. 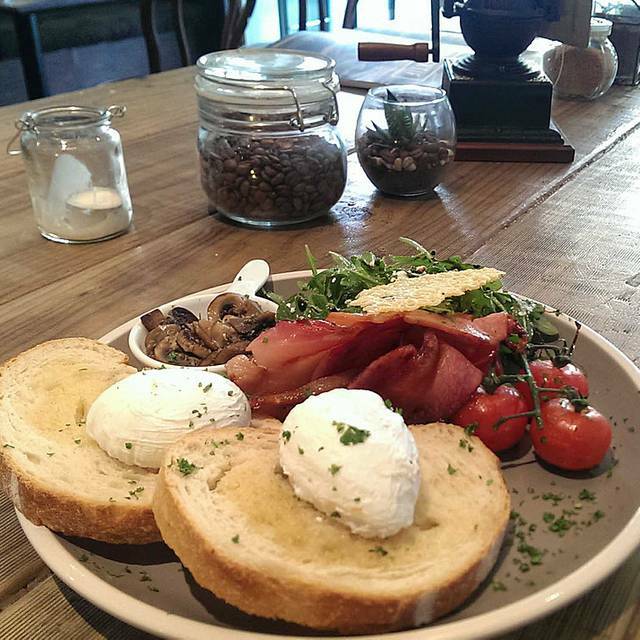 Eggs your way, bacon, truss tomatoes, garlic mushrooms, rocket and feta salad, with 2 pancakes or toast. Toasted ham, cheese, and Bechamel sauce sandwich with salad. Add a fried egg for a Croque Madame. The one and only, Stokers' original pancake chips, lightly seasoned with salt and pepper and herbs. Crunchy on the outside and chewy on the inside. with your choice of delicious homemade mayo made from scratch. Mayo Choices: vegemite mayo, blackpepper mayo, wasabi mayo, sweet chilli mayo, garlic parsley mayo, peri peri mayo. 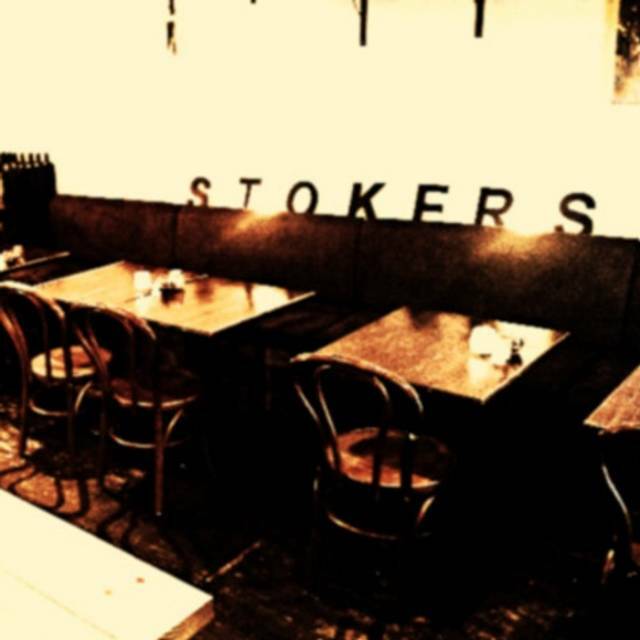 Stokers original pancake chips lightly seasoned with salt, pepper and herbs, with melted cheese and napoli sauce. 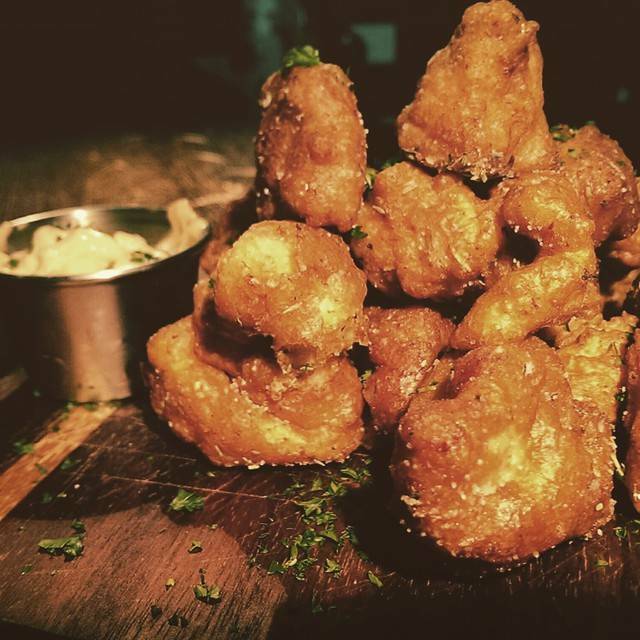 Deep fried chicken bites, coated with crispy pancake batter, seasoned with paprika, cayenne spice, herbs, pepper, and coffee to give it a smoky kick. Served with a side of peri peri mayo. Homemade Yerling station beef patty, with B.L.T., tasty cheese, caramelised onion and garlic parsley mayo. Served with a side of pancake chips. Lightly crumbed Rockling fillet, with lettuce tomato, tasty cheese, caramelised onion and homemade tartar sauce, served with a side of pancake chips. Chicken Schnitzel cut and crumbed in house with homemade parma sauce. Served with side salad and pancake chips. Lightly crumbed chicken breast, with B.L.T., tasty cheese, caramelised onion and garlic parsley mayo. Served with a side of pancake chips. Sautee mushrooms, beetroot, tasty cheese, caramelised onions, lettuce, tomato and garlic mayo. Served with a side of pancake chips. Pancakes with beef bolognese and melted tasty cheese. Served with side salad. Sauteed spinach with feta cheese and caramelised onions wrapped in pancakes. Served with side salad. Classic Ham & Cheese pancakes with tasty cheese and Virginia ham. Served with Side Salad. Cocktail potatoes cooked with green cayenne peppers, mustard seeds, cumin, turmeric and onions wrapped in pancakes served with side salad. Shredded chicken breast and sweet corn marinated in peri peri may wrapped in pancakes with side salad. Shredded chicken breast with cheesy mornay sauce wrapped in pancakes with side salad. Pancakes with mashed banana and Nutella. Caramelised apples with cinnamon spice and crushed walnuts wedged between pancakes, drizzled with salted caramel. Pancakes filled with mash bananas and caramelised banana on top. Drizzled with salted caramel finished with flaming Spice Rum for a fire spectacle. 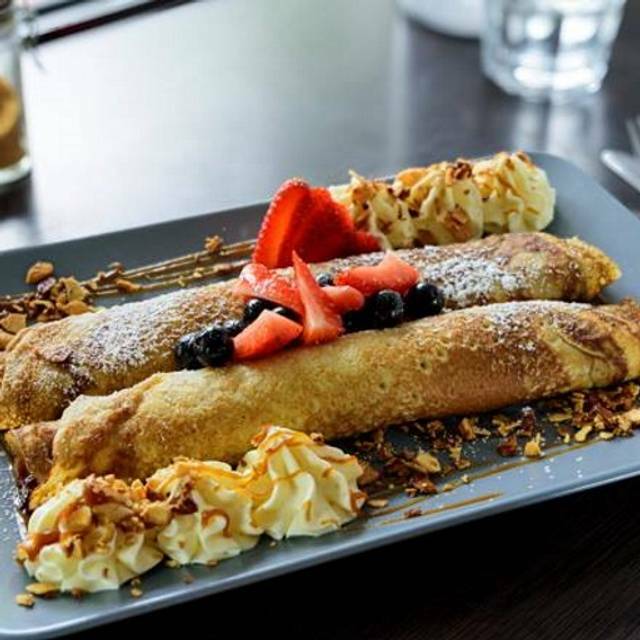 Unbeatable duo of home-made mixed berry jam and Nutella wrapped in pancakes topped with fresh berries. Pancakes with Belgium white chocolate ganache and raspberries dressed with white chocolate flakes. 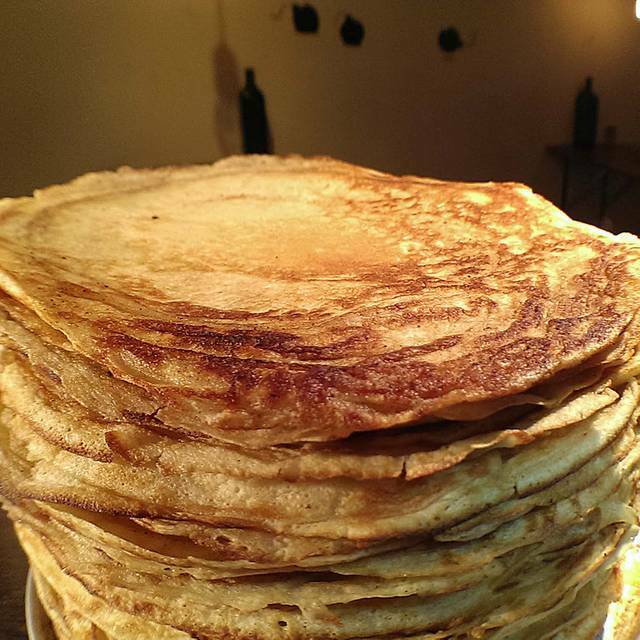 Pancakes with frangipane filling (made from almond meal and custard). Sprinkled with candied almonds, drizzled with honey. Rich golden syrup with butter to complement our delicious pancakes. Pancakes with heart-warming Yarra Valley strawberry jam, fresh cream and sprinkle of cinnamon sugar. Pancakes served with pears poached in red wine drizzled with reduced Merlot syrup. Light and refreshing. Fresh lemon juice with sugar and lemon segments with pancakes. Soft poached pears atop pancakes, drizzled with salted caramel. Pancakes with oranges zested butter and orange segments drizzled with flaming Grand Marnier. 60% Costar Rican Cerro Alto 30% Ethiopian Gelana Abaya Yirgacheffe. Chose this place on a whim and we weren't disappointed. My parents consider themselves pancake experts and they really enjoyed it too. Nice little hipster place, apparently there's outdoor seating but we didn't see it because it was winter. Signs say they're open late too. Went here for a Father’s Day breakfast. We were really impressed! They were willing to make anything to suit the kids. Pancakes were divine! Coffee excellent. Beautiful pancakes and cosy environment.service is friendly and prompt. Found this place by accident - and so so so glad I did!! 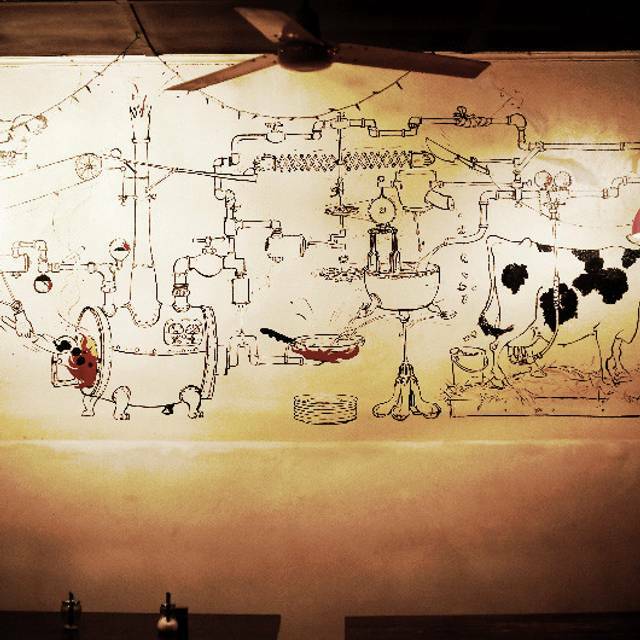 Wonderful food, great atmosphere! It was my first time at Stokers and I took my partner for his birthday. As soon as we walked in we felt welcomed, the staff were very friendly. I had the white chocolate and raspberry crepe and my partner had the Nutella Canon Milkshake. He absolutely loved it and would definitely visit again if we are in the area. Thank you. I had breakfast with a friend at Stokers on Easter Sunday. The restaurant was pretty quiet although that might be due to the holiday. The staff was friendly and didn't pressure us to order right away. The food came quickly and was delicious. I had pancakes and scrambled eggs and have to say that both are some of the best I've had in recent memory. The pancakes were thick and drizzled with maple syrup. The eggs had good texture and the portion sizes for both were better than I expected. I would recommend this spot for brunch and certainly plan to return again in the future. We booked successfully online, and they were closed when we arrived!!! !